I usually do a weekly wrap-up and stacking the shelves post in one but I’ve decided to separate them so I can focus on each one individually. 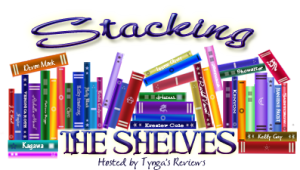 I may end up combining them again in the future but for now, my stacking the shelves post will be posted on a Saturday and my weekly wrap-up will be posted on a Sunday. I didn’t post a stacking the shelves post last week so all the books in this post are ones I’ve received over the last fortnight. This week I received a gorgeous print copy of Ghostbird by Carol Lovekin. I’m going to be reviewing this book for the blog tour on 21st March so had already been sent an e-copy but it was really lovely to received a finished print copy in the post too. I was contacted by the lovely author Sarah Painter to ask if I’d like to review her forthcoming book In The Light Of What We See, which I was thrilled about so I have a net galley copy of this to read too. This entry was posted in Blog Post, Book Meme, Books, ebooks, Stacking the Shelves and tagged Angharad Penrhyn Jones, Books, Bridget Christie, Carol Lovekin, Carys Bray, Claire King, ebooks, Emerald Fennell, Eve Ainsworth, Gilly MacMillan, Helena Earnshaw, James Dawson, Jo Marchant, Juliet Ashton, Kate McQuaile, Mona Awad, Rainbow Rowell, Raphael Montes, Robert Bryndza, Russell Banks, Sarah Hall, Sarah Painter, Shari Lapena, Susie Steiner, Tony Visconti. Bookmark the permalink. I got ‘H is For Hawk’. ‘The Guernsey Literary and Potato Peel Pie Society’, and ‘Wave’. I know, I was spending my birthday money from a few weeks ago though so I don’t feel too bad. I hope to read What She Never Told Me very soon as it sounds so good, I’ll definitely review it once I’ve read it. That Tony Visconti book will be a fun read! I think so too, I can’t wait to read it. I simply have to get s copy of the Gilly Macmillan! Missing Presumed is a fab read and all of your choices look great! I hope to read Missing, Presumed soon – I bought it as soon as it was released but because I’ve been in such a reading slump I’ve not read it yet. I treated myself to the Gilly Macmillan with the last of my birthday money – I enjoyed her debut so much that I just couldn’t resist it! CRUEL SUMMER IS THE BEST BOOK IN THE WORLD! I PROMISE, I LOVED EVERY MINUTE OF IT, AND I HOPE YOU DO TOO! YAYY! Ooh I really can’t wait to read it now! 🙂 Thanks so much for stopping by. Ahhhh. I want to read A LOT of these books. I hope you enjoy them! Thank you, it was nice to be able to treat myself with my gift card. The Rainbow Rowell is a novella for World Book Day so will be a short read. I’ve never read any of her books before so I thought this would be a good taster. The cover of Monsters is what intrigued me too – even though it’s like a children’s book cover there is something about it that really gives me the creeps! I’m keen to see what the book is like. I know, I really splurged this last couple of weeks but it was birthday money so it doesn’t really count! 😉 Kindred Spirits looks like a great short read so I hope to read it soon. WOW! That’s a lot of books – but kind of OK since that haul is for two weeks, right? I hope you’ll enjoy all of them. Planning to get that Juliet Ashton book soon! And I read Kindred Spirits and loved it so so much, just wished that it was a bit longer. 🙂 Have a wonderful weekend!! It’s currently 99p on Kindle in the UK so I couldn’t resist buying it – especially as it was on my wishlist. Great to hear that Kindred Spirits is a good read, I hope to read it very soon. Thanks for stopping by my blog, hope you have a fab weekend too. Lots of tempting books! I am also wanting The Perfect Girl. Enjoy your week, and thanks for visiting my blog. So many wonderful books! Perfect Days and 13 Ways of Looking At A Fat Girl look intriguing to me. Have a great week. I’m liking that cover for Crush. Enjoy your awesome haul!